My cousin’s wife writes a blog called The Daily Krier. Regularly she will detail stories of customer service failures and successes. I happen to have a positive experience to contribute, so I’m going to follow her lead. Unfortunately, I have to highlight a negative customer experience to get to the good stuff– so bear with me! 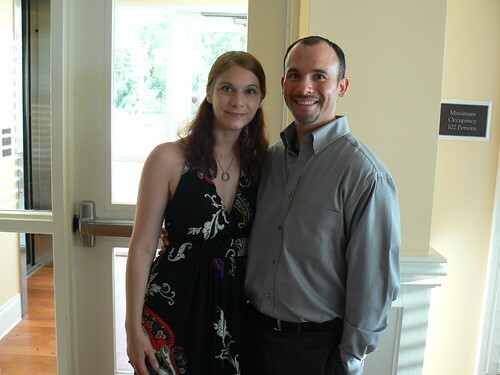 In late September Ryan and I traveled down to Naples, Florida for a wedding. Our trip was brief, we arrived in Naples 2 AM Saturday morning and we flew out early Sunday afternoon around 3 PM. On our flight there, Delta Airlines lost our luggage. Didn’t seem like a big deal at the time–it’s happened to me before and I get the luggage the next morning. Only this time, even though our luggage was supposedly only 2 hours behind us, it did not arrive until 5:30 PM on Saturday. This posed a problem as the wedding started at 3 PM and our warddrobe was limited. 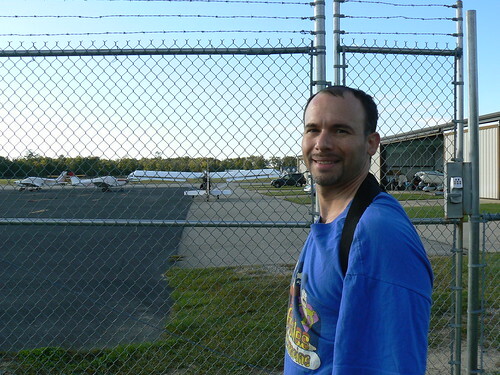 Case in point, all I had on me was a pair of dirty jeans, a dirty shirt and a complimentary T-shirt Delta gave me. 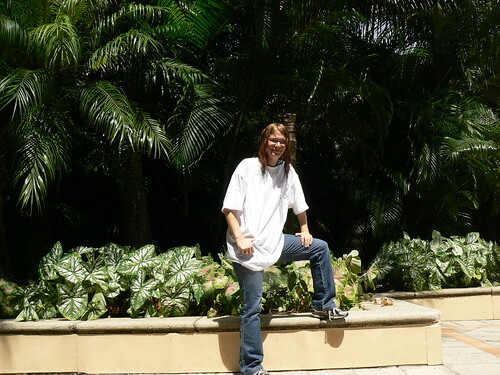 So instead of visiting with family, including all three of my grandmother’s living siblings, or seeing the beautiful beaches along the Gulf of Mexico, Ryan and I had to frantically run to a mall and buy clothes and toiletries. Delta felt very little concern for our situation, upon hearing about it, the baggage service staff defensively pointed out that we have to give Delta 24 hours to return our luggage. (Ideally, I would have liked to have been alerted to that on Friday night when we were given a choice between waiting for the luggage for two hours or having it delivered. Also ideally, you probably shouldn’t advertise that you deliver to hotels 24 hours a day and instruct us to alert the front desk about the coming baggage as that gives the very false expectation that you intend to deliver overnight). Anyway, what is done is done. Delta Airlines went out of their way to demonstrate how little they value our money. Luckily for Delta, they don’t need to worry about being taxed with our business ever again. But on to the good story!!! We had completely different experiences with the vendors of Coastland Center Mall. Upon hearing about our predicament, two vendors helped us out. The manager of the store, overheard Ryan and I talking about our situation, so he came up to the register and gave us half off one of our pairs of shoes. Our shoes did not qualify for a current sale in the store but, unsolicited, he gave us the discount anyway. I walked into the store and stated, “This is a long shot but….” I explained the lost luggage, showed them my prescription and asked if I could get a pair of contacts. Lo and behold, the staff emerged with a box for each eye (10 contacts total). I handed them my credit card and they wouldn’t take it. They refused. They were considering it free samples. Thanks in part to both of these vendors, Ryan and I were significantly more presentable at the wedding. Now here’s what’s absolutely amazing. Both of these organizations knew I wasn’t living in Naples. They knew I was traveling and that in all likelihood they would never ever see me again. There was no opportunity for repeat business. They had nothing to gain for their generosities, but they extended the courtesies anyway. They took better care of Delta customers than Delta! So, my deep gratitude to both Rack Room Shoes and Pearle Vision. If you are ever in the Naples area, pay them a visit and reward their kindness. Last week, I had to drop the dogs off at the vet for boarding. 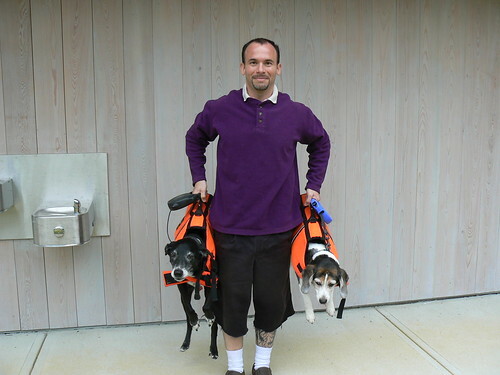 As knowing Jimmie trembled and clueless Henry wagged his tail, a female vet assistant emerged to take the dogs back. It turned out an older lady in the waiting room knew the vet assistant. “Are you still getting divorced?” she asked. “Yeah,” the vet assistant replied and bent over to leash my poor dogs. There was an awkward silence and the vet assistant looked perplexed. “Buying a horse?” she asked. And it was at this point, I realized I misheard the original question altogether. Are you still getting divorced? Are you still getting a horse? P.S. I bet Kristina can comment in the spirit and cadence of the Mr. Ed Theme Song! Last week, eleven year old Jacal came over to the house and asked a question he asks pretty regularly. There were any number of adventures Jacal could be referring to. Was he talking about jet skiing? 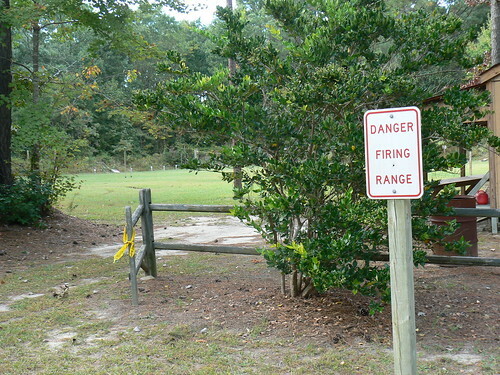 Perhaps geocaching? Rollerskating? Maybe he is talking about the time we took the injured opossum to the wildlife rehabilitation center? “To the place where we took the trash,” Jacal said. Jacal wasn’t talking about an adventure– he was talking about a chore! He was asking about a recent trip to the recycling center! You see, our household doesn’t have a recycling bin. Just because we are too lazy to go to town hall get a replacement bin does not mean we are too lazy to recycle! Binless or not, we still diligently set aside the recyclables. 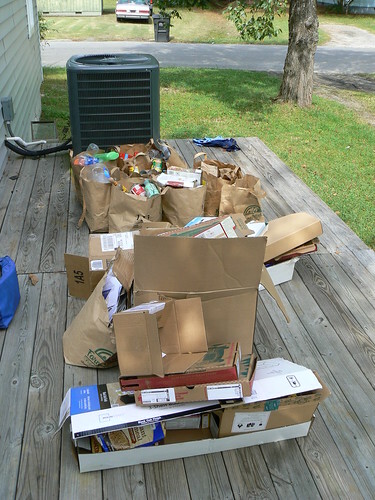 When our pile becomes overbearing…or… and this is more likely the case, we are expecting guests, we load everything up in the car and take it down to Fun Junktion. Just as I was about to depart, Jacal showed up. Right place, right time. He hopped in the car and we were off. En route, we had to pull over and marvel at a house. It’s entire front yard was covered in noisy blackbirds. And yet every other yard on the street was an uninterrupted (and quiet) green. Together we hurled recyclables into the appropriate dumpsters and felt fulfillment with each clang of aluminum or crack of brown and green glass. 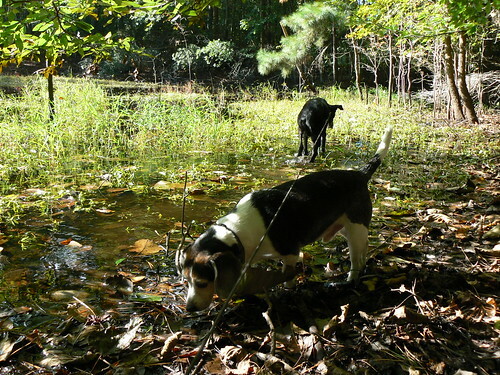 Afterwards, we went on a 1.25 mile walk around the nearby pond. At one point, Jacal stopped dead in his tracks and grabbed my arm. I looked to where he was pointing and saw Great Blue Heron in the pond. It stood still and silent and looked regal and prehistoric. It was a new species for Jacal. Later on our walk, Jacal kicked an ant hill. Two larger insects were standing nearby at the time. Wrong place, wrong time. As the ants rushed around trying to make sense out of the sudden chaos, those two bystanders were anointed instant scapegoats. The ants swarmed and despite their large size, the loiterers were quickly overpowered and devoured. I found it interesting and my companion was absolutely enthralled. A hoard of discriminating blackbirds, a solitary heron and unforgiving ants. These are humble, ordinary creatures and yet they demonstrate just how much discovery and adventure nature still provides, especially to young eyes. In Jacal’s mind it was worthy of the same inquiry as our other outings. 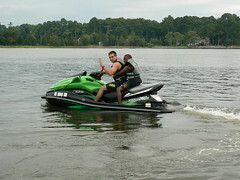 On the caliber of jet skiing even! 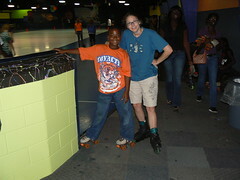 By coming out all the way to Fun Junktion, I was reminded exactly why I do recycle. “So when are we going again?” Jacal repeated his question. “Uh…” Already there was a small pile of cardboard and plastic gathering in the kitchen. But on the other hand, I had no visitors scheduled. “When the pile gets big again.” I said. For the most part, I find my adventure destinations through the Internet. Perhaps I read an article about a trail or spied an interesting destination on geocaching.com or noted a neat looking field at Google maps. 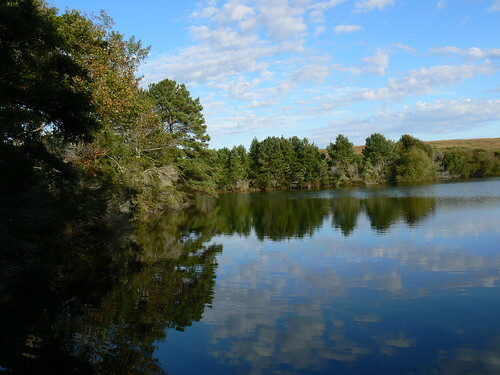 But one of my favorite area spots, Currituck County’s Maple Park, was uncovered in a much more old fashioned manner. Word of Mouth. 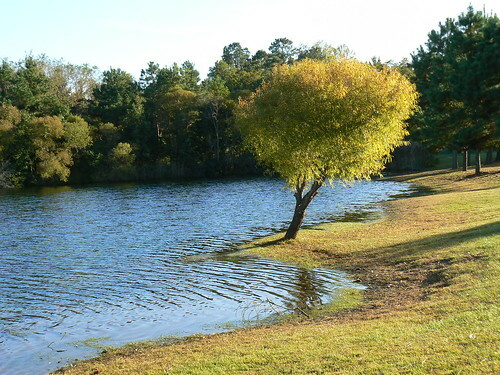 The park is located right by Currituck County Airport and features a skate park, a baseball field, walking trail around a pond and my favorite part– a network of hiking and horse trails through a forested canopy and open fields. I made my third visit with Ryan and the dogs earlier this month. 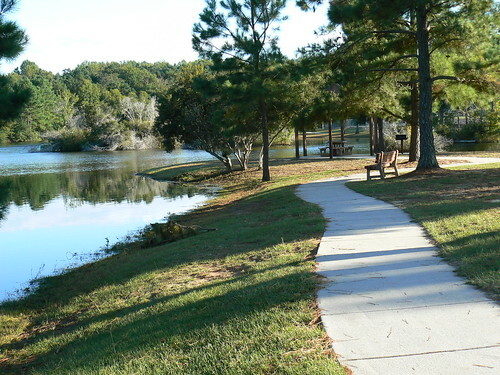 If you want to keep it simple, you can stay on the 0.4 mile paved path and walk along the park facilities and pond. Feeling more adventurous? 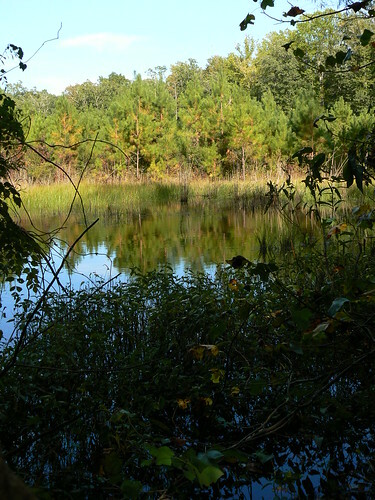 The trails can also take you into the forest, past ponds and canals, through fields, past the Sheriff’s Shooting Range and very close to the airport. 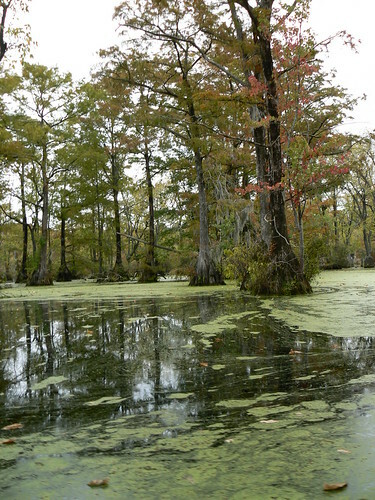 The trees are typical to the area– Bald Cypress, American Beech and Water Oak. We also saw flowering bushes, beautiful mushrooms and a special oddity which warrants its own section below. On this particular hike, we got to greet a special guest! 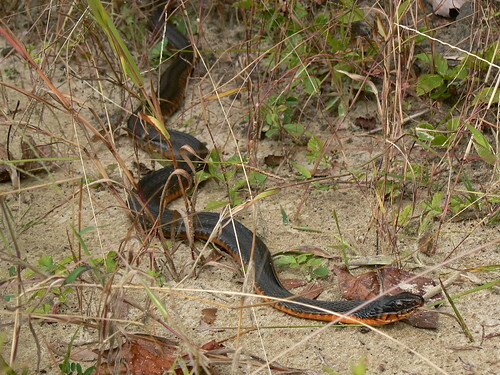 A Red Belly Watersnake. The most exciting find on the hike was this little specimen in the forest near the trailhead. 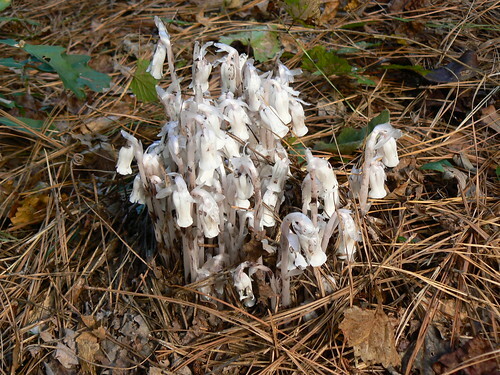 Just in time for Halloween, we spotted Ghost Plants, otherwise known as Indian Pipe. I first learned about them from thru-hiker Joe Frambach, but this is the first time I’ve actually seen one. 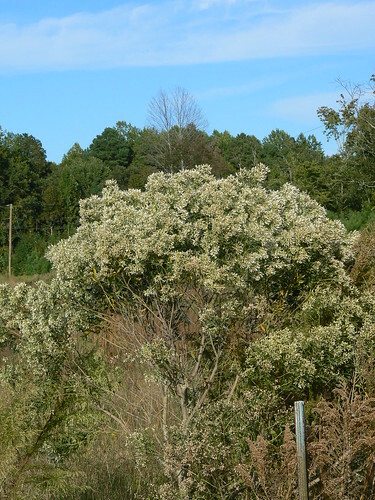 Ghost Flowers are a haunting white because they don’t have any chlorophyll. That means they can’t make their own energy through photosynthesis. So they steal it! 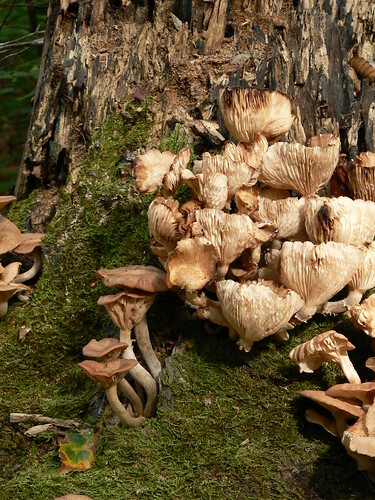 They snag their nutrients from fungus which in turn steals it from trees. As Clint pointed out, the trees are taking their energy from the sun. So we are all little energy thieves one way or another. Beautiful Maple Park is well worth a visit. Just like the two hikers I heard about it from, I’m passing it on via my blog and…good ole fashioned word of mouth. You can get to the trail from the upper parking lot. After eight miles, you’ll pass the airport. Take the first left on Airport Road. Maple Park and parking will be on your right. At ten years of age, Henry the Beagle is having a landmark year. In June, he went on his first camping trip at Mount Rogers, Virginia. Today, he went on his first boat ride. 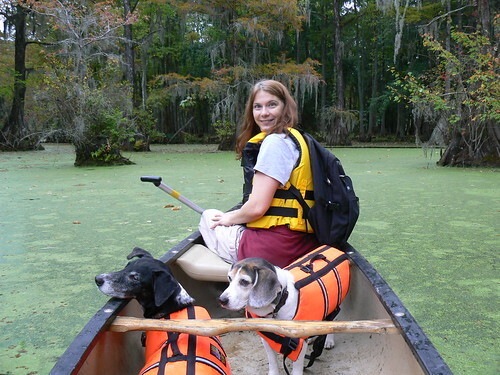 A canoe trip at Merchant’s Millpond State Park in North Carolina. 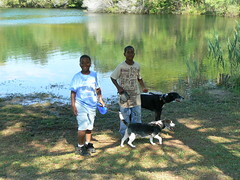 Henry was joined by Jimmie, who is an old pro when it comes to dog boating. Jimmie’s been on speed boats and row boats and paddle boats. A canoe would not be a tough transition for him. It was a great day to paddle Merchant’s Millpond. With the crisp fall weather, the changing leaves, and the haunting backdrop of deformed baldcypress trees, it definitely felt like Halloween is approaching! I am happy to say that Henry did an excellent job on the trip. 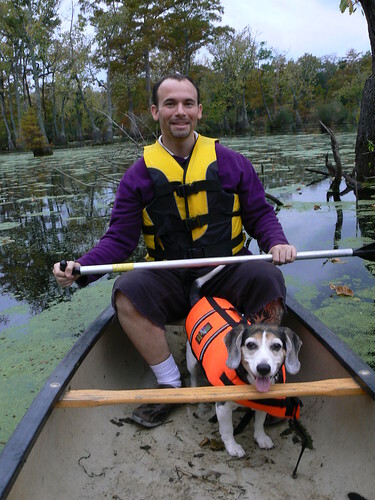 In fact, he seemed more relaxed in the canoe than he is in the car. I suppose it didn’t hurt that he had a lot of neat things to look at and smell. Just like camping, Henry surprised me with his calm and quiet. All these years, he had been limited to day hikes. I’m looking forward to taking him canoing again! 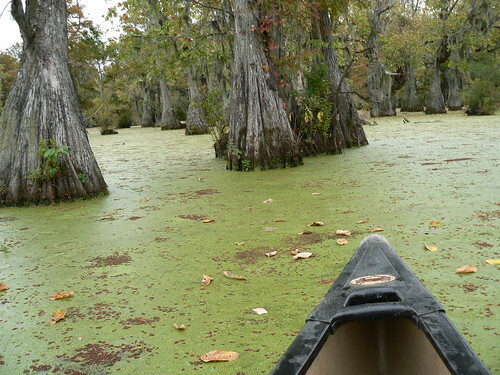 Till then, more pictures of Canoing Merchant Millpond State Park can be found on my Flickr site. With some of our pawpaws from the Dismal Swamp State Park, we made Pawpaw Bread. It’s like banana bread, just with pawpaws instead of banana. I thought it was delicious. Although I couldn’t tell the difference between it and normal banana bread, my mother said she could. The recipe I used below is similar to the one in Better Homes and Garden’s New Cook Book (I add vanilla, put in more cinnamon and of, course, use pawpaws instead of bananas). After removing the numerous seeds, mash the pulp of the pawpaws with a fork. In a mixing bowl combine the pawpaws, the egg, the sugar and the olive oil. Mix in the baking soda, baking powder, cinnamon, lemon peel, vanilla and finally the flour. Pour in a loaf pan and bake 50 to 55 minutes or until a wooden toothpick inserted in the center comes out clean. 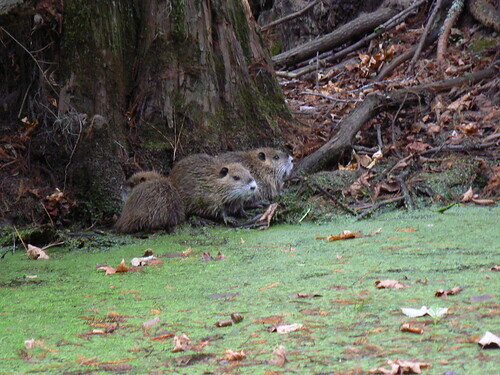 I received an email from the Roanoke Appalachian Trail Club about an interesting event that will occur on Saturday. The Dartmouth College Outing Club is trying to hike the entire Appalachian Trail in a single day. On October 10th the first-ever single-day hike of the Appalachian Trail will be attempted and they need Roanoke’s help. The trail will be divided into segments, which will be hiked by various volunteers. Each hiker will have a printable logo to take a picture with on the hike. The pictures will be collected along with trip reports to make a document memorializing the hike. This event is being organized by the Dartmouth College Outing Club. Can you help? Visit the AT in a Day website, register, and use their Google Map interface to register for your hike. 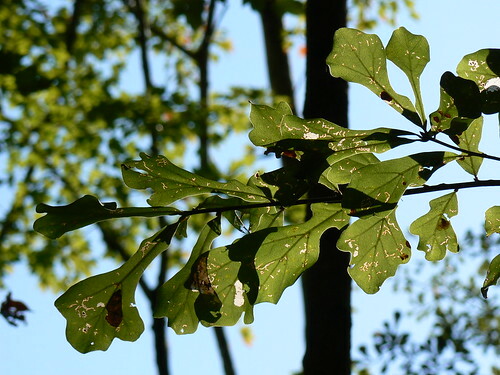 Even if you aren’t in the Roanoke area, if you are interested in hiking the Appalachian Trail this weekend, you may want to take a peak at the AT in a Day website. I believe they are also looking for hikers in Tennessee and Georgia as well.